Do not get to attached to your corporation(s). 1830 is first and foremost a game about generating the most value possible from money and stocks. This is done by dealing and sharing stocks in train corporations and building routes that will pay good dividends. 1830, while time consuming, has fairly simple mechanics. Alternating stock and (sets of) operation rounds until an end game condition is met, either the bank runs out of money or a player goes bankrupt. It all starts of with a special stock round where 6 private companies is auctioned off. These are quite different and will earn its owner money each operation round until phase 3. In addition most of them have a special ability which may be used during the game. This is then followed by a regular stock round. On your turn during a stock round you may sell as much of your owned shares as you like but you may only purchase 1 share (there is one exception but no need to touch upon that here). This can be done in any order so you may sell-buy-sell if you want. However, you may never purchase a share in company in which you have already sold a share earlier in the stock round. Each share is 10% of the company except for the director share which is 20% and must always be the first one purchased. When 60% of a company is owned by players (or in the bank pool) the company is said to be floated and will be allowed to perform actions during upcomming operation rounds. The stock round will end only after every player has consecutively passed so you may still act after you have passed as long as someone else does something else then pass. The left hand player of the last to act will receive the priority deal and will be first to act in the next stock round. – Build – adding track to the map or upgrade a tile already on the map. The director of a company will perform all actions for a company. When adding track a director may either extend track or upgrade a track as long as it can be traced back to a station marker through an uninterrupted line of tracks. He may add a new token to allow a company to run better routes or block other companies. Finally by running trains owned by the corporation he will generate income for the shareholders and/or company. Each train controlled by a corporation may be run, but no two routes may overlap on any part of the track. The total revenue may either be kept in the treasury of the corporation or paid out to the shareholders with each share paying 1/10 of the total. Stock price will move left if withheld or right if paid out. Finally the director may purchase train(s) if the corporation is not at the current train limit. 1830 is a game with lots of action, especially with experience. There are so many traps lying around that it will be hard not to fall into anyone. The first couple of games will likely be much about building and running good routes and earn income. With a few plays under the belt there will appear a second, and much more brutal game as the stock manipulation, managing the train rush and priority deal becomes the focus. The game starts with 2-trains which can only run between 2 cities/towns. They are followed by 3, 4, 5, 6 and Diesel trains. When the first 4 is bought all 2s rust and are IMMEDIATELY removed from the game. 6 trains remove the 3s and diesel removes the 4s. On top of that any corporation with a legal route has to own a train and have to purchase one either from the bank or another corporation owned by the player. If it hasn’t got the money the director has to pay from his own pocket even to the point of shelling shares if needed to make up the needed money. If still not enough he goes bankrupt and the game is immediately finished. If everyone avoids going bankrupt which often is the case among new players the cycle will repeat until the bank brakes aka is out of money. After the complete set of ORs players will calculate money and value of all shares on hand with the highest total being declared winner. Do I love 1830, or 18xx generally. Big time! Quite possibly my favorite genre although it took a few games to see the ingeniality of it all. This is a game with lots of levels that takes lots of time exploring and is absolutely worth it if willing to put the hours in. Few game experiences are as fulfilling as the first time you manage you complete a “corporate dump” and forcing panic on others are indeed quite a rewarding moment. We played 1830 at least 50 times now, since it came out long ago (1994-ish) so I think I am qualified to review it. 1830 is conceptually a simple game. After an initial purchase round (IPR), there is a stock round (SR), and an operating round (OR), then an SR and so on, alternating, until during an SR or OR either a player goes bankrupt, in which case the game ends immediately; or until the bank breaks. In spite of the above, I would never ever invite non-gamers or women to play it. They always go yuk when they see us in action. It is an old-school hard-core game in the Avalon Hill style of almost unreadable 30 pages of legal scribblings, as in this x is allowed on y unless z applies as described in section 23.5 and so on. There is a more modern version which we play nowadays that clarified a lot of the rules and made it more modern, but still. We all know all those rules by heart of course. During a SR it is about players: players buy shares from the bank, that has an enormous amount of cash; during an OR trains run, and get profit, which the bank pays to players. So that is the basic money flow. During an OR it is about the corporations: players put on the hats of Directors of operation: the running corporation (order determined by stock market), places a tile on the hex board (the Eastern US during the 1830’s), pays the bank to place a blocking token on a hex, runs his trains on the resulting grid, then buys trains. So that is the ever-revolving theme: ’tile,token,run,train’. There is much more to it of course, when you have your corporation pay dividends it becomes more popular, and in the stock market figure the stock rises, which may mean your corporation will go earlier next turn. A standard game of 1830 takes forever: to break the bank you have to end up with diesel trains that run $1100+ per track. Also there is a website that points out some blurred rule cases on which a group can agree, and it is important to adhere to such rule conventions. We use a set time, from 12:30 to 18:30 to play, and when we end on an OR we play until the 3rd, and if we are in a SR we stop. The trouble with a fixed group of players is that some habits grow, for example a player that never dumped B&O or PRR will tend to have people blindly buy stock from his corporation. It’s a lot about psychology of the stock market. Initially, there are only 2 trains, meaning they connect only 2 cities. The only tiles to lay are yellow (simple) train tracks. There are 7 of those, and whenever one player buys the 6th share of a company and has track from his starting position he must buy a train. If the 2-trains are already sold from the bank, the player as a director must buy a 3 train. This train is more expensive but can connect 3 cities, and will give his corporation more revenue, and if he declares dividends he will receive part of this revenue via his shares of that company. But there’s more: the event that the first 3rd train is bought, green tiles are available, indicating the progress in technology. When the last 3-train is sold, and a player wants an extra train, he must buy a 4-train. At this moment, all 2-trains are immediately removed from the game! This can cripple players running corporations having only 2-trains, because a corporation must buy a train when it has track, so not only they lose their trains, they also must pay $300 to forcibly buy a new train, and they are personally responsible, so if the corporation lacks funds, the player must fork out his personal cash, and if he has not enough, he must sell his stock. But he must remain president and so may not sell of his stock stock of the troubled corporation such that another player becomes president. If he still has not enough cash, he goes bankrupt and the game ends immediately. Also as the game progresses, more and more OR take place in-between SR, indicating the acceleration of technological progress. What makes this game so brilliant is the constant vigilance you need to have so that you don’t get backstabbed, while at the same time you want to plunder your corporations, and dump them on others. The game is so rich… however you won’t want to play with non-gamers, because the look and feel is too dry for them. Most of the fun is in your mind, as you hatch plots and avert others. You really feel a director with all the director problems, but as I said in modern terms it just takes too long. Modern games take up at most 90 minutes, at least in my environment. A final word of warning: there is a dosbox version of 1830 the board game on pc, but while the AI is fantastic, you are not playing the board game really: the pc game does not respect the conditions that a ‘legal extension’ (of laying track, by the running corporation) must satisfy as explained in the rules. It goes too far here to explain, you will see when you try. 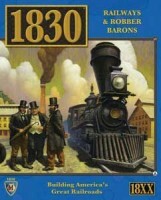 Add a Review for "1830: Railways and Robber Barons"